This seems to be a repeat of the problem I had in SM 2.49.3. Then no video from Udemy would play after an error message. That was about a year ago and I had to use Firefox for that work. Very disappointing. About two months ago I tried 2.49.3 again and it worked! Before that other Youtube and some Vimeo´s were OK.
With 2.49.4 I thought this issue would go away, but no. Now I get the start of the video and then it flashes off with a Waiting for page-events.ustats.udemy.com message in the bottom left corner. That is, in fact, after having done that for the second time; SM would retry loading that site content. I am registered and paid up for the course and properly Logged In. I am on a Lenovo G580 using Mageia 6 Linux. I did take screenshots of how things went, but they will not upload here. I cannot find the action to upload images.The image utility here allows text actions only. I did all the Mozilla Standard diagnostics, but nothing worked. Restart, default themes, safe mode, nothing. shows no real difference between SM 2.49.4 and FF 60 but some with Chrome 60+? which seems not to matter much. I suspect that there may be an update for SM 2.49.3, to correct this, that was done over the last year and thought I may install 2.49.3 over 2.49.4, but that's pushing it a bit. Any ideas are very welcome, thank you. Last edited by DanRaisch on October 19th, 2018, 4:23 am, edited 1 time in total. I forgot to check Notify me when a reply is posted, thank you. You didn't say whether you could view the course preview video in SeaMonkey 2.49.4. I can view that without any problem. Yes, I can do that. The intro is 1:57 minutes long. There are 14 free sample video's on that page and I can viewed one or two of them as well. I checked that now in response to your query without thinking or signing in. Sound was loud and clear as well. Then I signed in, clicked the drop down to pick a course, got the Go to Lecture 6 button, clicked. The video preambles and logo's started rolling then at the time the lecture itself was to start the screen went black with the message. The correct wording of that is Wating for page-events-ustats.udemy.com. While the preambles showed there was a train of messages reporting handshakes to google-analytics, facebook, yahoo and several others. I tried another course, but the same result with even a blip of sound in the earphone once, as if things are getting cut short. Firewall? Anti-virus? But FF works. Shorewalll is installed with Mageia 6, for the rest I have installed only three apps that did not come with Mageia 6 Core Release. Oh yes. I re-installed Mageia 6 recently from the ISO disc as I crashed the RPM database and could not repair it. 2.49.3 was running then. At the same time I installed 2.49.4 after having done all the OS updates. That touches on another issue which can wait . . . Maybe related to this? (Issues around SM update deficiencies? With 2.49.3 I did create a symlink to 2.49.2 which did not work). After SM updates apps that need to open SM to access the Internet will report the error "Child process cannot be found". Not even with clean installs - not "over' - the previous SM version. I am still too dumb in Linux to help myself properly so have to destroy all and start over again. The above reference to symlinks reminds me. I tried similar to Firefox for plug-ins and even copied what I could see to SM, but could not not get it working. Did a lot of research on Cisco, H.264 et al. No go. FFMPEG would not load. Gnash simply swamped me with GCC (installed really). Just gave up. FF did work. Then again, Monkey has no attitudes. On this page, can you see all the options active? If you download this video, can you see it? You are showing the preview page video which I said was no sweat. Video and Audio OK. That is OUTSIDE the course material. Once I have logged into the course to continue at say Lecture 6 in Ethical Hacking the problems start. Everybody can see the preview and in different browsers. 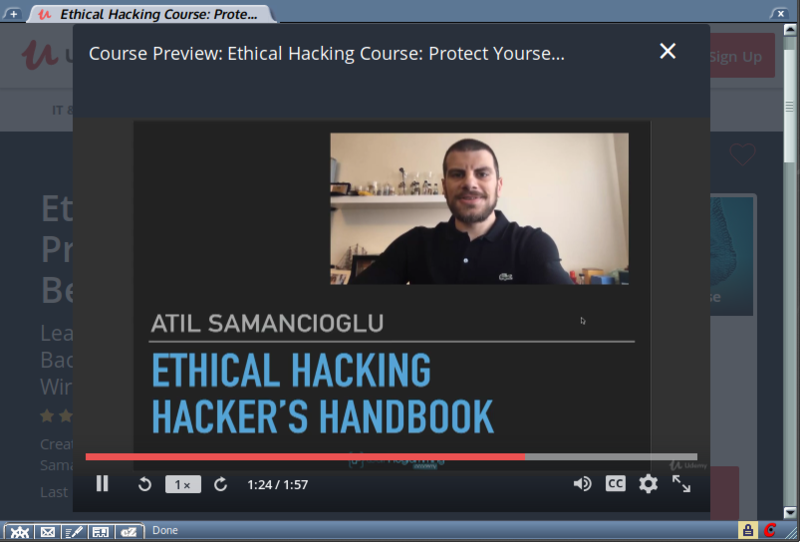 I can also see course material for Lecture 6 in Ethical Hacking in Firefox. You cannot see the course matrial unless you are paid up for that course. So, on my computer, the problem lies with Seamonkey exclusively. This is what I had in media. Configure media sources for install and update'. no metadata found for medium "Core Updates Debug (distrib49)"
no metadata found for medium "Core Updates Testing Debug (distrib51)"
no metadata found for medium "Core Backports Debug (distrib53)"
no metadata found for medium "Core Backports Testing Debug (distrib55)"
no metadata found for medium "Nonfree Release Debug (distrib57)"
no metadata found for medium "Nonfree Updates Debug (distrib59)"
no metadata found for medium "Nonfree Updates Testing Debug (distrib61)"
no metadata found for medium "Nonfree Backports Debug (distrib63)"
no metadata found for medium "Nonfree Backports Testing Debug (distrib65)"
no metadata found for medium "Tainted Release Debug (distrib67)"
no metadata found for medium "Tainted Updates Debug (distrib69)"
no metadata found for medium "Tainted Updates Testing Debug (distrib71)"
no metadata found for medium "Tainted Backports Debug (distrib73)"
no metadata found for medium "Tainted Backports Testing Debug (distrib75)"
[All of these have this error, no errors on anything else]. updated medium "Tainted Updates (distrib23)"
updated medium "Tainted Updates Testing (distrib25)"
updated medium "Tainted 32bit Updates (distrib42)"
updated medium "Tainted 32bit Updates Testing (distrib43)"
Then checked the codecs again. I did this before I started this post. Yes The HTML5 player is currently used when possible. Then I right clicked on the link at the bottom to open in a new tab. After that I copied the link location and pasted it. In both cases this is the repsonse I received. This server could not verify that you are authorized to access the document you requested. Either you supplied the wrong credentials (e.g., bad password), or your browser doesn't understand how to supply the credentials required. This is the kind of issue I suspected from the beginning. This is a REPEAT of the issue I had in 2.49.3. Then I got the error that the browser does not support the video codecs. Nothing would load at all. I still used SM for all other Internet videos. Later I found that Seamonkey loaded and played course material correctly. I never skip any Mageia updates. Period. In 2.49.3 I did not even pay attention to Tainted Media, but SM worked only later for Udemy. The only option for that (against the SM release policy) is that SM got updated and or set to rights incidentally by fluke. Now I can see the video and course controls, but when the lecture has to load and play it stops. Thank you kindly anyway. I will talk to Udemy´s support people, but like last time, I do not think they will e able to help me. I am familiar with Mageia´s Control Centre and install procedures as well as with the basics in the command line, thank you. That is Linux. Apologies for possibly creating a false impression. What I meant was that I am not familiar with where to look or what and how to make amendments to a program like Seamonkey. That is app specific and where I need help. Honestly, I don't know what your problem might be. You have already installed, all the missing audio & video codecs. And have made, the standard diagnostic (safe mode, new profile... etc) without being able to correct the problem. Anyway, you have commented in one of your messages; that you also had other problems when using SeaMonkey. So personally in your case, I would make a backup of the SeaMonkey user profile folder, and perform a clean install of SeaMonkey 2.49.4. OK so, just to let you down gently and to state it clearly. a Clean Install. I Do Not Update Monkey as per the warning on that Mozilla.org page. At that time I got the same diagnostic as I had after updating to 2.49.3 from 2.49.2. It read "Could not open child process Seamonkey. No such File or Folder". A simple repeat of the same issue. This is the secondary issue I mentioned earlier. 2. My basic approach to this is to do Clean Installs. Period. Caused by my Windows experience of nags, updates and crashes - finally reason for kicking it in the teeth. Applics directory on an External Seagate Hard Drive. The tarballs are then copied to Applics on the Internal Hard Drive, from where I install it. non-Mageia apps, I installed Seamonkey 2.49.4 as a Clean Install - and the video issue re-surfaced again. I get your point of saving the profile folder, but think it irrelevant to the issue. Without me doing Anything to Seamonkey 2.49.3 whatsever, the video issue healed itself over time. Weird. Please convince me that Any Seamonkey developer will be happy with this. Ghost in the machine. The second reason I am not entirely convinced of the health of saving and re-installing the profile folder is the possible re-infection of a new install with old infections. But I will take that under advisement, as they say. Seen together, these two reported diagnostics tell me there is something amiss in Seamonkey's update processes. Seamonkey Should update or do Clean installs without further tweaks like this. It runs on Firefox' Gecko engine and other modules, after all. I tried to implement Firefox plugins with copying or symlinks, but no go. This is where I say I am too dumb in Linux yet to help myself. Anyway. Thank you very much for your time and patience. Oh! then, just as a diagnostic, do you have Mageia 6 installed on your machine? As an obverse exclusive or test? But then it would have to be a Lenovo i3 G580 laptop as well . . . I am leaving this intact since I believe the developers should know about this. Ta. Siduction (debian sid), SparkyLinux (debian testing), openSUSE Tumbleweed, VoidLinux, Antergos & Manjaro (Arch). I just use a stable version of GNU/Linux (debian 9.5) on one computer in my work. In all of them, I have installed SeaMonkey (2.49.4, 2.49.5, 2.51 and/or 2.53) manually (tar.bz2). The last time I used Mageia (Mageia 5.1) was at the end of 2016. I could not agree more! The fact that I am posting on this forum is proof that I am deadly serious about and loyal to Seamonkey. I do not waste time on apps with snitty niggles. Agreed as well on manual installs. I will definitely take you up on the 2.5+ installs. Actually, that reminds me that I have not yet awarded Seamonkey my OWPA - One Wire Pliers Award. Pick it up. Use it. Put it down. No sweat. No comebacks. You get the OWPA or you don't. You've got it. Firefox lost it. Then, thank you, you helped put a solid colour to this. On Saturday Tim Buchalka my Java course instructor on Udemy posted a notification that the issue is experienced system wide their side. Some Issue with 1080p videos. The advice is that you can work around it by going into the video settings, switch off the Auto mode and set the video at 720p. Did all this and none works. As per Tim's advice I am now mailing Udemy to tell them I am still having problems, using this URL as reference. It pains me to do this, but it seems this is a problem unique to Seamonkey. I tested all my Courses on Udemy. I have access to about thirteen courses. Seamonkey 2.49.4 will not show any videos, but will show a course done in flash cards, while Firefox 60.3.0esr and Chromium Version 68.0.3440.106 (Developer Build) Mageia.Org 6 (64-bit) show all of them with out fail. The issue is thus not confined to one instructor with possibly a unique set-up to stream his videos. This was raised in mail from a Udemy agent. In addition I edited SM preferences again to unset any security switches and warnings that may cause any hiccups. Same result. Did the standard diagnostic as well. Still nothing. Had only one theme and removed that. Seamonkey is not the pig in the tale. We need to find out why this happens. Any ideas on where and how to download Seamonkey 2.50+? Cuadro wrote: ... Any ideas on where and how to download Seamonkey 2.50+? PD.- On the other hand, Mageia 6 has Iceape available in its repository. I also can't play videos on Udemy. I'm glad to hear (I think) that I'm not the only one!